The Imāmat is the office of spiritual and religious leadership recognized in Shī‘ī Islam according to which the Imām is the spiritual and religious successor (waṣī) of the Prophet Muḥammad. While prophetic revelation ended with the Prophet Muḥammad, divine inspiration, spiritual authority, religious guidance, and mystical gnosis continued in the institution of Imāmat. The esoteric meaning and the gnosis of all revelations and traditions has been preserved and transmitted through an uninterrupted chain of Imāms which stems from the Prophet Adam and continues with present Imām Mawlānā Shāh Karīm al-Husayni Āgā Khān IV. The present Imām is himself the direct lineal descendent of Adam, Noah, Abraham, Imran, and the Prophet Muhammad. The Seventh Cycle is the Cycle of Resurrection (dawr al-qiyāmah) in which the esoteric interpretation (ta’wīl) of all prophetic revelations is revealed. In this final Cycle, knowledge (‘ilm), gnosis and spiritual truths (haqā’iq) become available to humanity at large and the people of the world become unified. The Seven Cycles (“The Seven Days”) all together form a Major Cycle (“The Week”) of seven thousand years which began with the Prophet Adam – the Adam of the Qur’ān and the Bible. However, Cyclical History as envisioned in Ismā‘īlī gnosis extends even before this Adam – who was but merely the first Prophet of the current Major Cycle and not the first human being in an absolute sense. The Prophet Adam himself was preceded by a countless number of Cycles during which the lineage of Imāms was also present (see Henry Corbin, Cyclical Times and Ismaili Gnosis). Various Ismā‘īlī texts document an entire lineage of pre-Adamic Imāms – the Imāms who lived on earth before the Prophet Adam of the Bible and Qur’an. Several of these pre-Adamic Imāms include figures from Indian and Vedic traditions such as Shri Rāma and Shri Krishna – whom the Ismā‘īlī traditions, particular those of South Asia, considered to be the Imāms of the ancient periods. These lists are found in the Ghatpāt Du‘ā’ (see here) of Pir Ṣadr al-Dīn and the writings of Fidā’ī Khurasāni (see here) as well as other sources. The Imām al-Mu‘izz, in paying tribute and invoking blessings upon his ancestors, makes specific reference to the Imāms of the ‘bygone periods and ages’. 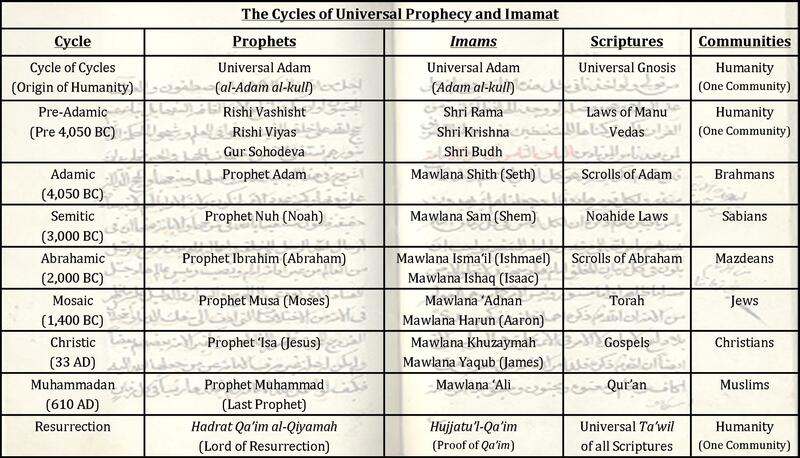 The below Chart (created by Ismā‘īlī Gnosis) depicts the various Cycles while highlighting the Prophets, the Imāms, the Scriptures, and the community of each Cycle. The existence and influence of the Imāms upon a plurality of traditions, civilizations and communities displays the universality of the Imāmat. The Imāmat is not only an institution of Muslim leadership, but its scope and mission extends to people all faiths. Today the present living Imām – Mawlānā Shāh Karīm al-Husayni Āgā Khān IV – is the inheritor and guardian of the universal gnosis which emanates from all religious and spiritual traditions – including the Adamic, Semitic, Abrahamic, Jewish, Christian and Islamic revelations. The dates before Jesus are approximate and subject to debate and speculation. The events of Mahābharata War have been dated by Dr. Padmakar Vishnu Vartak (see link) to 5,561 BC which was before the biblical timeline of Genesis (which began around 4,000 BC) and the birth of Prophet Adam in India. Similarly, the genealogies found in Ismā‘īlī sources place Shri Rāma and Shri Krishna before the Seth and the Imams of the Adamic Cycle. Shri Budh (see the Ginān Budh Avatar) was the last Imām of the pre-Adamic Cycle who initiated the Cycle of Adam and appointed Adam as the first Prophet. In the Persian and Arabic traditions, he is referred to as the Resurrector (qā’im) Imām Hunayd and should not be confused with the founder of Buddhism who lived much later. Each Cycle began with a major Prophet (Nāṭiq) who was accompanied by an Imām called the Asās or Waṣī. The Prophet of each Cycle revealed a Scripture and a religious Law and established a unique religious community. The Asās-Imām succeeded the Prophet as the interpreter of the revelation and the leader of the community. The Imāms succeeded one another in direct lineal descent except in the case where the Prophet emerged from their line (in the case of Adam, Noah, and Abraham) in which the permanent Imāmat was transmitted from grandfather to grandson (e.g. from Lamech, father of Noah, to Shem, son of Noah). The genealogy and timeline of the biblical figures is found in the Bible. From a strictly historical point of view, the names in the genealogy before the period of Moses may actually stand for entire tribes or generations, in which case these genealogies must be taken symbolically and not literally. Nevertheless, they serve to illustrate the underlying theme which is the presence of the Imāmat in every epoch and period. After Prophet Abraham, the institution of Imāmat continued in two parallel lineages – the Permanent Imāms descended from Ismā‘īl and the Entrusted Imāms descended from Isaac, with the latter including many of the well-known Isrā‘īlite Prophets and Imāms (including Isaac, Jacob, Joseph, Moses, Aaron, Joshua, David, Solomon, John, Jesus, James). The Entrusted Imāms of the Isrā‘īlite line continued until the Cycle of Prophet Muhammad. The lineage of Permanent Imāms continued in a hereditary succession through the line of Ismā‘īl (including Mawlānā ‘Adnān and Mawlānā Khuzaymah) to the time of the Prophet Muḥammad and continues thereafter in the line of Imām ‘Ali ibn Abī Ṭālib down to Imām Shāh Karīm al-Husaynī. The Ismā‘īli texts named Simon Peter (Shamun al-Safa) as the Imām succeeding Jesus. However, contemporary research shows that Jesus’ brother – James the Just (Ya’qūb al-Ṣādiq) – was his actual successor (see Robert Eisenman, James the Brother of Jesus). The Cycle before Adam (termed as “Pre-Adamic”) was a Cycle of Resurrection in which humankind enjoyed an exalted level of gnosis, spirituality and ethics. The Qur’ān refers to Pre-Adamic humanity as being “one community” in the verse: “Mankind was one community and God raised Prophets as bearers of good news and as warners and revealed to them the Book with Truth that it may judge between mankind concerning that in which they differed” (Holy Qur’ān 2:213). But humanity began to turn away from the primordial religion of tawḥīd and began to differ amongst themselves which prompts the beginning of the Cycle of Adam and the sending of the Prophets. With the coming of the Seventh Cycle – the Resurrection – humanity is judged and returns to the state of “one community”. The initiator of the Seventh Cycle, the Cycle of Resurrection, is the Lord of Resurrection (Qā’im al-Qiyāmah) who does not bring any new prophetic message but reveals the esoteric meaning or universal ta’wīl of all the previous revelations. The Imām directly preceding the Qā’im is his Proof (hujjah) or Gate (bāb) and will be the most exalted Imām of the Six Cycles. Truly interesting and I must add you’re doing a marvellous service to your ismaili brethren. This article speaks of there being Adams before the historical Adam. In a waez by Abu Aly Alibhai, he said that a man once asked Muhammad who was before Adam. Muhammad said there was Adam before Adam. The man continued the same question and Muhammad told him that there were about 30,000 Adams before Adam. Is this one and the same as your article talking of Pre-Adams? Well, it does not get any clearer than that, not in my books anyway! Mashallah. The article is most enlightening and illuminating. It really brings into perspective the nebulous timelines that are so elusive to the average mind. The attempts to quantify them are indeed laudatory but I cannot help but be somewhat skeptical not knowing the extent of research done and the resources consulted. Although there has been a fair bit of interfaith comparisons and extrapolations to elucidate these and coincide time frames with each prophethood, the question still remains, is this still just a thesis? I am in no way questioning the authenticity, but it is quite natural for one to justify a puzzle if the part fits. A very challenging posting for all interested in the essence of Religion, Faith rather than just rites and practice of it. Thank you so much I learned a lot . I had so many confusion which is cleared just by reading this page. awesome research … thank you for uploading here.. It goes beyond the time, let alone certain countries. In Quran God says their is no place on earth that God has’nt send Prophet and Imams. Fantastic work, gives great amount of knowledge, your research is very valuable. I really salute to your research. I totally agree with your arguments which are true. I am proud to be an Ismaili and we have read the history and we dont have any doubt in it. This research can unify mankind – from the divisions it suffers now. There will ofcourse be resistance to ‘mankind unity’ from established vested interests, but hopefully will not last very long as the humanity becomes more & more knowledgeable & acts for its own good. Thank you for your intereting topic and I hope we will read more interesting topics from Ismaili perspective. Please provide the reference for the hadith quoted at the opening.